Still a winter sky, but clear with no snow - I am so OVER winter!! About Calvin who starts his first day as an EMT today! After three months he will have full medical, dental and vision which will be a real blessing for our family. He will also only have to work three days a week (12 to 14 hour shifts) to be considered full time - so he wants to hold on to his job as a lifeguard as well. It's just very exciting for me to watch him take those first steps out into the adult world. I am thankful for...my husband and so happy that he made it back from his trip to the west last week. I really missed him. From the learning rooms...Putting the finishing touches on CLEP test preparation for Sam. I am going to work on more writing skills with the other kids this week. It's funny how becoming good readers, doesn't necessarily equate to being good writers - although when I told the kids, "write something that you would like to read!" I saw a few light bulbs in their minds go off! From the kitchen... Very low key this week with Ash Wednesday and then first Friday in Lent. I will say though Tuna Helper was on sale this week and when Mr. Pete saw it he snapped it up - he just loves that stuff!! We use low fat milk and margarine to mix it up so it's not that bad calorie wise and it tastes pretty good too - but I just chuckled because Mr. Pete was so happy with this find! I've got a tasty bean soup planned for Friday. I am wearing...blue pants, a cream colored shirt with my big purple sweat shirt over it and my black bedroom slippers. I am creating...memories for my children as we get ready to recognize the season of Lent. I am going... to really work on that exercise program this week. I hope to incorporate a walk or two if the weather gets a little better. 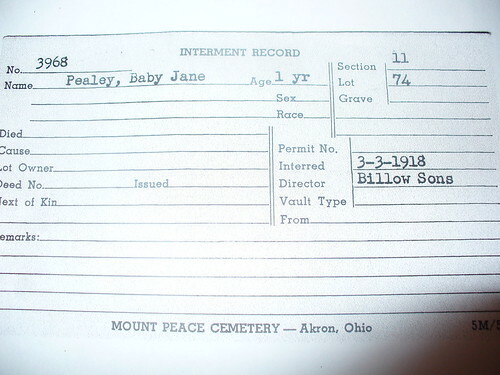 As a side note, this little one died in 1918 which was the time of the great flu pandemic. I wonder if she was one of the victims? I am hearing...my normal low ear buzz. and nothing else. Around the house...Get ready for lent! I have new purple table cloths! This is Sam practicing on Saturday for his Sunday Debut. I'll be blogging more about that later. 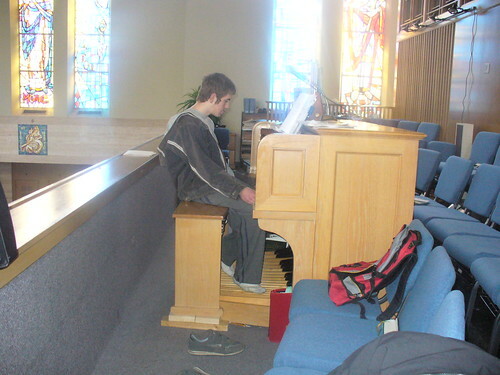 It was amazing to see how far he has come since starting organ lessons last August! He actually plays the pedals with his feet - which is amazing to me anyway, but to watch his long size 15 feet fly over the pedals like that was really something to see. I have new respect for organists - I think you have to have pretty strong ab muscles to be able to hold your body weight off of your legs to move your feet so fast!